We have been fascinated by the simple method of construction to place a Stirling on 3 axes. We applied this idea to our model engineering character and we created a lying, oscillating model with some technical particularities: speed regulation, glass cylinder and displacer, spirit tank in the basic plate, air guidance through the vertical axes. 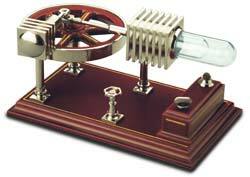 flying wheel D-80 mm, glass, heating cylinder and displacer.